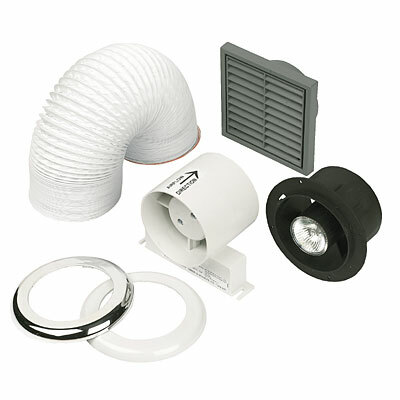 This Low Voltage extractor fan kit is supplied with both chrome and white bezels to fit over the built in light on the intake end. The unit is particularly useful for extracting steam directly over a showering area as the intake tastefully illuminates the showering area with its built in low voltage down lighter. The kit lends itself to installations where the ducting passes through a loft area (or in a floor void) and the in line fan can be located somewhere mid way along the flexible duct to the grey external grill.